There is so much to do and so little time to list everything I want to! Please, anytime you have an event or know of one coming up, do email me at SNHKids @gmail.com and I’d be so happy to put your event on! I don’t know about you, but I can’t wait for school to be out so we can have more free time for fun! Mother’s Day Fun all weekend! Check out our huge list of what to do, what to get and where to go for mom! Make sure to visit Far Out Bubbles!!! Everyone will want to bring home her amazing bubble wands and products! 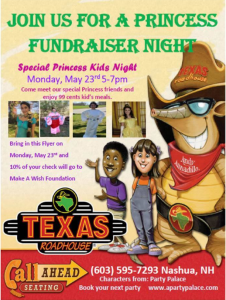 Make A Wish Fundraiser at Texas Road House with Party Palace! Call 236-4695 for more info. 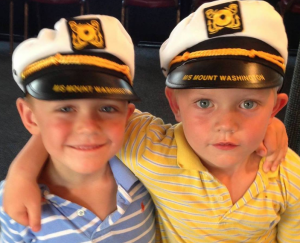 Take your kids on a cruise on beautiful Lake Winnipesaukee for free Memorial Day Weekend. Offer is good on all daytime cruises from all ports with a limit of 2 children per adult. For more information visit their site or call 603-366-5531. See all the summer cruise events HERE! I just found out my favorite bubble company, Far Out Bubbles will be here too! You’ve got to get these bubble kits, your kiddos will LOVE you! Over 50 booths to sample food and drinks! Live entertainment and fireworks to end the night. « Summer 2016: Summer Must Go, Do & Stay!